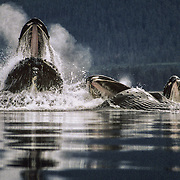 This was the incredible activity that held me transfixed for so many years, and kept me coming back for more. 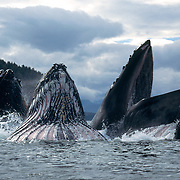 I paddled to the verge of physical exhaustion just so that I could experience this spectacular phenomenon again and again. 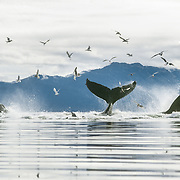 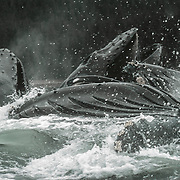 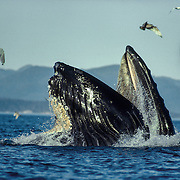 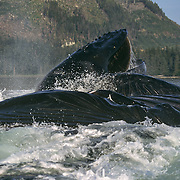 When the humpback whales return to Southeast Alaska every summer from their breeding grounds in Hawaii, where there is insufficient food, they sustain their feeding activity around the clock to capitalise on the abundance of food in the nutrient-rich waters. 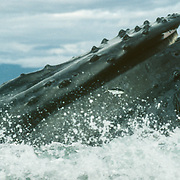 They employ various techniques depending on the conditions and prey, and the necessity to optimise their efforts by working cooperatively. 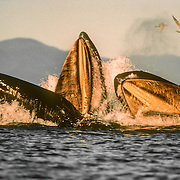 Sometimes they will skim the surface or lunge upwards through the prey if they are feeding individually, especially on the easier targets like krill. 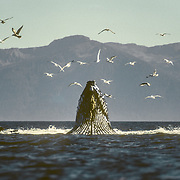 But for shoaling fish like herring that require a greater strategic effort, they will often work cooperatively in groups up to 20 whales using a bubble net to trap the prey. 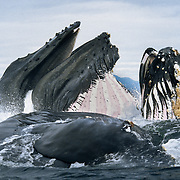 When a shoal of herring has been located the whales dive beneath them with one releasing a stream of bubbles whilst corralling the shoal in a spiral. 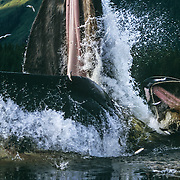 This creates a curtain of bubbles, which panics and traps the fish. 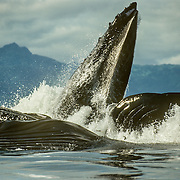 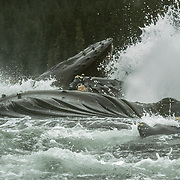 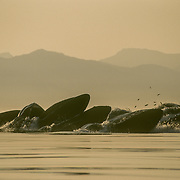 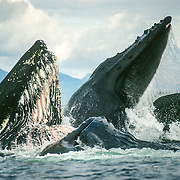 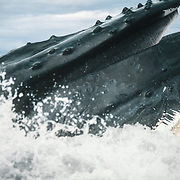 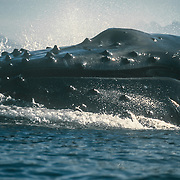 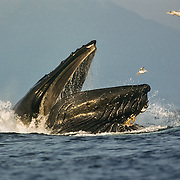 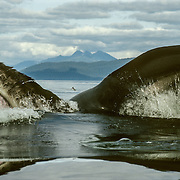 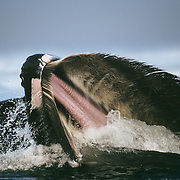 The whales then drive the fish to the surface and engulf them with gaping jaws. 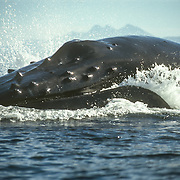 Another whale produces resonating vocalisations that further panics the fish into bunching up into a ball within the net. 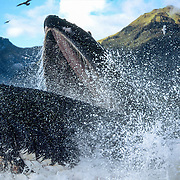 There are other animals that deploy bubbles to trap their prey, but the advanced techniques used by the humpback whales of Southeast Alaska are unique. 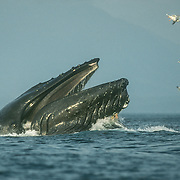 Research has determined the socially complex nature of the cooperation involved. 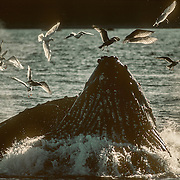 The precision and organisation of the strategy can clearly be seen on the surface, where the whales regularly surface in the same relative formation, but beneath the surface there is task specialisation with one specific individual blowing the bubble net and one creating the vocalisation to herd and panic the fish. 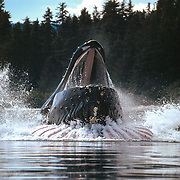 Also the same individuals regroup every year but are not blood relatives.